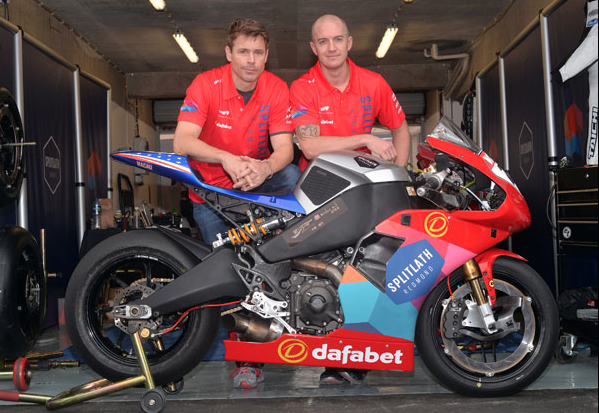 British road racing team, Splitlath Motorsports, has confirmed that it will be contesting the 2014 Isle of Man TT Races, fuelled by Monster Energy, with a unique all American line-up. They will compete aboard the all new, American made, EBR1190RS from iconic manufacturer Erik Buell Racing. This will be the first time that the EBR’s have raced on the TT Mountain Course. Splitlath will field Americans Mark Miller and Brandon Cretu, both experienced TT riders. The decision to run the EBR 1190RS comes after a successful outing with both Miller and Cretu at the 2013 Macau Grand Prix where they finished 11th and 20th respectively. This represented a significant improvement for both riders in finishing positions and lap times compared to recent years, which proved the bikes pedigree to Splitlath Motorsports team owner, John Dimbylow. Both Splitlath riders will race the Rotax-powered, V-twin, EBR1190RS in the Dainese Superbike, RL 360 Superstock, and PokerStars Senior TT races. The confidence inspiring chassis and high corner speed of the EBR’s has the team aiming for good results and the riders shooting for personal bests. The team is also doubly excited to be promoting a brand new bike to the fans at the TT races. 2014 will be Mark Millers’s fourth consecutive year riding for the Splitlath outfit on the island. Miller has become a formidable competitor since his debut in 2006 and also has the distinction of being the fastest American in the history of the event with a lap of 125.507mph. He also won the 2010 TT Zero Race for clean emissions motorcycles. Brandon Cretu will be Miller’s teammate. He is looking to continue the success that the pair enjoyed at Macau. Cretu’s has recorded a fastest lap of 117.8mph around the TT course, which he achieved last year and is looking to significantly improve on that time in 2014.